As the German army began to adopt heavier and heavier tanks and tank guns, the US Army soon felt it would need a heavy assault gun or tank destroyer to both deal with them and German fortifications. The gun decided upon was a high-powered 105mm weapon dubbed the T5E1, but while trialed on a T1E1 (“M6A2") tank chassis it was found to be not sufficiently mobile or armored to serve the purpose. As a result, a new super-heavy tank chassis was designed and five prototypes were ordered in March 1944. The new tank was actually an assault gun with the new gun in a ball mount at the front of the hull. Parts were borrowed from other US tanks to speed development, such as a modified version of the HVSS suspension from the M4 series tanks and T80E4 track from the M26 tank as well as other components. Dubbed the T28 heavy tank, it was soon redesignated as the T95 150mm GMC due to the lack of a turret. But in the end only two pilots were built; even Pacific Car and Foundry had trouble producing a vehicle this large and heavy. But due to all of the problems with its construction the first prototype did not reach AGP until 21 December 1945 – three and a half months after the end of WWII. The T95 ended its life as a test mule at the Yuma Engineer Proving Ground but one did survive and is now part of the Armor Museum Collection at Fort Benning, Georgia. For many years this beast has been a popular subject for scratchbuilders, usually in 1/72 or 1/76 due to its huge size. But now, on the heels of the Meng A39 Tortoise, DML has released a new kit of this monster in 1/35 scale. It has more parts than any other DML kit other than the K5(e) Leopold gun, which is a lot for a vehicle 37 scale feet long. 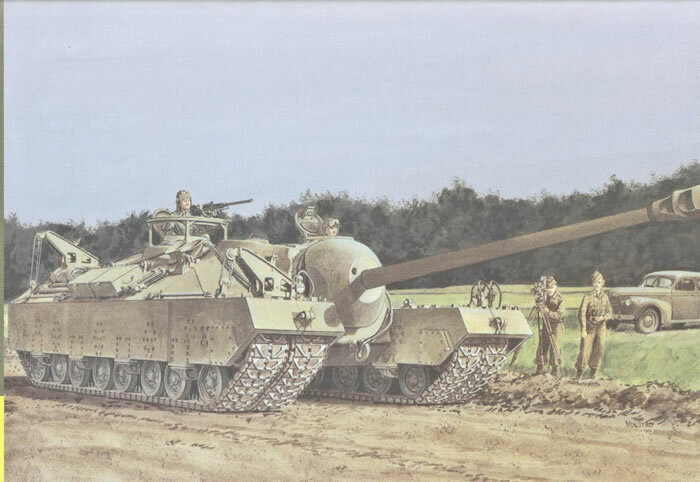 But sadly DML muffed the dimensions of the vehicle as they apparently assumed it used standard T80 type tracks with a 23" width; it does not, as the tracks used for this tank were narrowed to only 19.5" each. The result is that the basic vehicle has a scale width of 131" (95mm) and the auxiliary tracks each have a width of 31.6" (23mm). That results in a total width of 194" (141mm); the actual vehicle dimensions were 124" and 27.75" or 179.5" (130.2mm) overall. The only good news is that, like the Commander Models M6 heavy tank, the vehicle is so big that many modelers probably won’t notice or care. There are a number of anomalies with the kit. For one, DML DID get the modified HVSS bogies (no shock absorbers) right but they use a metal spring inside each of the HVSS spring units for reasons best known to themselves. Each bogie (and there are 16 of them) consists of 23 parts with separate tires and wheels to each one. There is a lot of work in the inner mounts for the auxiliary track runs – each has an etched brass operating lever that needs to be installed during assembly, and they are handed with 12 unique ones included. But as someone noted on the CAD drawings, DML apparently missed the fact that there are facing inside the auxiliary track runs and as a result the modeler will have to chase down photos of the runs off the vehicle to get them right if he wants to show the tracks being towed or attached. The aforementioned tracks are neatly done, but they are the usual DML HVSS style track which requires the guide teeth - here the later style T80E4 style with “fork” center guide and not the T80E1 “box” style. There are 408 shoes per tank (four runs of 102 each) and DML provides every one of them. The rest of the kit is pretty straightforward. The muzzle brake is slide moulded and suitably massive, and two Sherman sprue sets are provided for the commander’s and driver’s cupolas. The nicely done DML M2HB machine gun from their late M4 kits is also included. The last two steps cover towing the tracks with the various tow connections or fitting them to the main vehicle and also the optional track fitting winches (two are provided with a choice of four possible locations on each side). No credits for technical assistance are provided for this kit. Only one finishing option is provide – olive drab with “T95.1" and registration number 40226809. A number jungle is included on the Cartograf sheet to opt for the second vehicle (40226810) or “Panzer ‘46" what-if finishes. Overall, it is disappointing that DML would go to this much trouble for a new kit and make such a bad mistake on the width and tracks used by the vehicle.